Add cashews to a bowl, cover with hot water and let soak for at least 2 hours.While cashews are soaking, preheat the oven to 425F. Peel and chop the potatoes and arrange them on a baking sheet with the broccoli. Drizzle with about oil and season with salt and pepper.Roast for 20 - 25 minutes until the broccoli is starting to brown and the potatoes are soft (they don't have to be totally soft because we'll be blending them later). Allow the veggies to cool slightly. 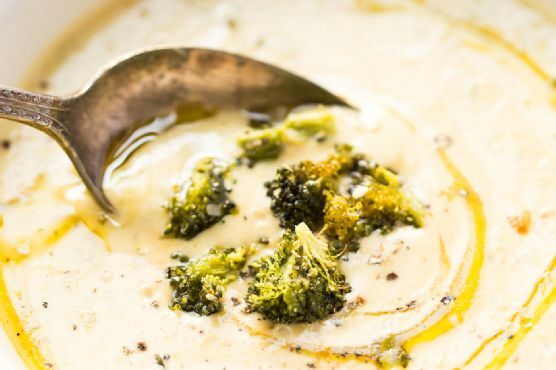 Set aside 1 cups of broccoli and add the remaining vegetables into a high powered blender. Drain and rinse the cashews, adding them to the blender along with the nutritional yeast, hummus and quinoa. Pour in 3 cups of broth, miso, garlic powder, lemon juice and additional salt and pepper, and blend on high until smooth and creamy. Taste and adjust seasonings (adding more garlic, salt, pepper, miso or other seasonings) as desired.Finely chop the reserved broccoli and add to the blender. Stir with a wooden spoon (don't reblend) and serve warm topped with a drizzle of olive oil and a sprinkle of nutritional yeast.